Innovative engineering, improved processes and excellent quality haven't gone noticed. 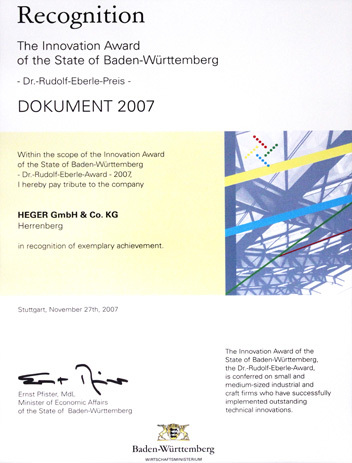 In 2007 Heger GmbH & Co. KG received the "Innovation Award of the State of Baden-Württemberg – Dr. Rudolf Eberle-Preis" for the development of their trendsetting compression concept. The prize committee was particularly impressed by the fully automatic density control (ADC) with programmable setpoint speed. With its innovation, Heger has made a significant contribution to the efficient, gentle and yet extremely economical recirculation of plastic foams. In 2006, the outstanding efficiency of its recycling systems earned the company the special award for trade presented by the Volksbank and Raiffeisenbank financial network in Baden-Württemberg.